The Nature Index is a database of author affiliations and institutional relationships. The index tracks contributions to research articles published in a group of high-quality natural science journals, chosen by an independent group of researchers. The Nature Index provides absolute and fractional counts of publication productivity at the institutional and national level and, as such, is an indicator of global high-quality research output and collaboration. Data in the Nature Index are updated regularly, with the most recent 12 months made available under a Creative Commons licence at natureindex.com. The database is compiled by Springer Nature. There are four metrics provided by the Nature Index to track research output and collaboration: article count, fractional count, collaboration score and multilateral collaboration score. The simplest is the article count (AC). A country or institution is given an AC of 1 for each article that has at least one author from that country or institution. This is the case regardless of the number of authors an article has, and it means that the same article can contribute to the AC of multiple countries or institutions. To get a sense of a country’s or institution’s contribution to an article, and to ensure they are not counted more than once, the Nature Index uses fractional count (FC), which takes into account the share of authorship on each article. The total FC available per article is 1, which is shared among all authors under the assumption that each contributed equally. For instance, an article with 10 authors means that each author receives an FC of 0.1. For authors who are affiliated with more than one institution, the individual author’s FC is then split equally between those institutions. The total FC for an institution is calculated by summing the FC for individual affiliated authors. The process is similar for countries, although complicated by the fact that some institutions have overseas labs that will be counted towards host country totals. When comparing data over time, FC values are adjusted to 2017 levels to account for the small annual variation in the total number of articles in Nature Index journals. The adjustment of FC values in each year is done by calculating the percentage difference in the total number of articles in the index in a given year relative to the number of articles in 2017 and applying this adjustment to FC values. The third metric is bilateral collaboration score (CS). A bilateral collaboration can be between any two institutions or countries co-authoring at least one article in the journals tracked by the Nature Index. CS is derived by summing the FCs from articles with authors from both institutions. The collaboration score between two institutions A+B is the sum of each of their FCs on the papers to which both have contributed. Another metric, multilateral collaboration score (MCS), is an indicator of collaboration between multiple institutions. Multilateral collaboration, between a group of three or more institutions that co-author articles in the index, can be calculated for an individual institution or a group of institutions. MCS accounts for the number of collaborating institutions on a given article, so it can be added across multiple institutions, always resulting in a total FC of 1 for each article. MCS is derived by first dividing the total article FC for each collaborating institution by one less than the total number of institutions (n) which collaborated on the article (i.e. n-1). This is done for each collaborating institution, and the values are summed for each pair of institutions to give the total MCS for that pair on an article. The MCS for an individual institution (A) is the sum of the values from each of its pairs (e.g. (A+B) + (A+C) + (A+D) etc.). Each query will return a profile page that lists the country or institution’s recent outputs, from which it is possible to drill down for more information. Articles can be displayed by journal, and then by article. Research outputs are organized by subject area. The pages list the institution or country’s top collaborators, as well as its relationship with other organizations. Registering allows users to track an institutions’ performance over time, create their own indexes and export table data. 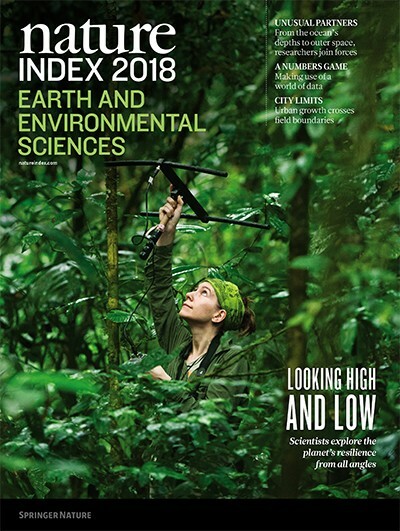 Nature Index 2018 Earth and Environmental Sciences is based on data from natureindex.com, covering articles published during six years from 1 January 2012 to 31 December 2017 at the country level, and articles from 1 January 2015 to 31 December 2017 at the institution level. The tables rank institutions by their FC in Earth and environmental sciences from 2015 to 2017. The proportion of each institution’s FC in Earth and environmental sciences relative to the institution’s total FC from 2015 to 2017 is also provided. Separate tables rank the top academic and government institutions, as well as the top institutions in each region. Additional tables ranking institutions by their multilateral collaboration score are provided, as well as the top bilateral partners in Earth and environmental sciences.